The Dallas Mavericks forward joined one of the most exclusive clubs in basketball history, becoming just the sixth NBA player to score 30,000 career points. That summer and beyond, with three first-round bow-outs still yet to come and the annual affair that was the Mavericks’ free agency disappointment, this would become a familiar reprieve. But when Nowitzki scored his 30,000th point on Tuesday, in a game against the Lakers that could help the Mavericks inch closer toward the eighth spot that he once bemoaned and put him up there with Kareem, Karl, Kobe, Michael and Wilt in this elite scoring club, there was a redeeming value to the moment that few saw coming a few years back. Even with this challenging landscape that he had lamented, with Dallas far from dominant and Nowitzki’s current teammates including an out-of-nowhere point guard named ‘Yogi’ and the other Curry (Seth, not Steph), there was still a joy in Nowitzki’s game that has never wavered. Nowitzki rose up on that right baseline early in the second quarter, muscling the stepback jumper up and over the outstretched reach of the Lakers’ Larry Nance Jr., and the American Airlines Center building that has been his for so long now exploded. Cuban raised his arms in celebration once, then again moments later when Nowitzki added a vintage bit of dramatic flair, and the Mavericks’ owner was dancing like a blissful child. 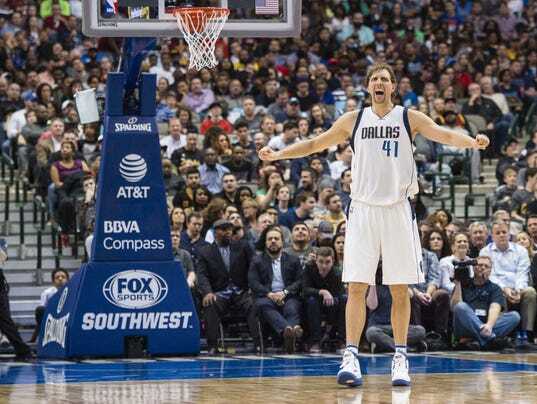 Nowitzki buried a three-pointer from the top – one dribble to the left, re-set the feet and fire away – and found himself engulfed by a mob of teammates at mid-court. That smile that finally came, perhaps as much as the wicked, one-legged stepback and the everyman persona, is the most memorable element of Nowitzki’s legacy. NBA commissioner Adam Silver offered his praise following Nowitzki’s milestone jumper, too.